While the boys were out of the house (staying with my parents during the summer holidays) DW and I have did our 'spring clean' and rearranged a whole lot of furniture. I moved my old raw pine bookcase into DS1's bedroom (now that he's in high school he does homework in his room and needs a bookcase there), and I decided to buy a new, slightly larger bookcase for my 'home office'. 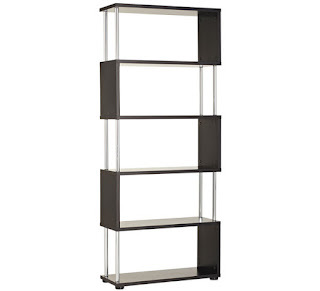 After wasting time looking through several furniture stores (that didn't sell any bookcases for less than $400), we finally found the Ecco bookcase shown below in a discount furniture store. It was reasonably priced at $99, and looks quite stylish for the price, and the chrome matches the legs of my telescope tripod sitting in the corner of my home office. However, as I wanted a bookcase about 1.2m wide, and the ecco is only 800mm wide, I decided to buy two of them. The flat packs went together very easily, although it took quite a while to assemble them due to the complicate arrangement of poles and panels used for the sides of the bookcase. 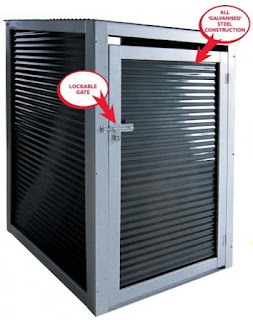 I also recently spent another $198 buying a couple of 'bin covers' (shown below) from our local hardware chain store. While I think bin covers are a stupid idea (why bother to try hiding rubbish bins away, when they have to be put out for collection every week anyhow? ), I bought these two 'bin covers' as the basis for constructing a 'roll-off' (or possibly 'tilt-off') roof for the small observatory I plan to build on my parent's hobby farm. These covers should be just large enough to accomodate my 10" Meade LX10 in 'stowed' position, if I install the telescope on a permanent-pier mount. I intend to automate the operation of the telescope as much as possible and run observation sessions from inside the farm house (or remotely from Sydney if I setup a local server), so the 'observatory' doesn't need to be very large at all, just protect the telescope for the elements and wildlife when not in use. The bin covers were on clearance sale (normally the RRP is $199 each) as the manufacturer has discontinued this item. I decided to buy them even though I probably won't get around to building the 'observatory' for several years, as they are a lot cheaper than alternatives such as using a small garden shed. Since the telescope and accessories are 'worth' (i.e. cost) about $10,000, this is a small price to pay. Of course none of this 'discetionary' spending had been allowed for when I put together my monthly budget for 2013, so it looks like January will already have a large 'variation'. Will Rudd drink from the poison chalice?